This case study describes how they found it to complete and what they’ve done as a result. Chris Franks and Mark Sutton report on their use of the self-assessment tool. Last year the Surveillance Camera Commissioner launched a simple to complete self-assessment tool. 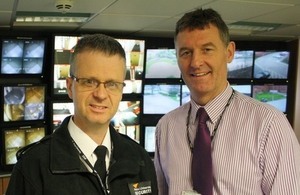 Aston University used it to see how their CCTV system measured up against the code of practice. As a professional organisation we want to make sure we are complying with all relevant legislation and be sure that our system is fit for purpose. The tool is designed to help organisations assess where they’re meeting the 12 guiding principles in the Surveillance Camera Code of Practice and where more work may be needed. It can be saved as a PDF and the Commissioner is keen that organisations publish the completed tool on their websites. It’s possible to be largely compliant with some principles and to fall short against others. The tool takes organisations through each principle and they can complete an action plan to help identify how they will get their systems up to scratch if they are falling short. It was straight forward and took around two hours in total to complete the self-assessment. It’s reassuring that we’re meeting a number of the guiding principles such as making sure the system is running effectively. There are some areas we need to tighten up on too like implementing a system for handling complaints. The action plan at the end of each principle helped us plan how we’ll do this. Since completing the tool Aston University has been able to plan how they will continue meeting the guiding principles and make improvements where needed. The tool was really useful it gives clear guidelines and uniformity for organisations and individuals. It helps you professionalise your system for those using it which can only be a good thing for the communities you protect. I’d definitely recommend that anyone using CCTV covering public space should use the tool.